Mater-Bi mulch film represents a proven alternative to the traditional plastic mulch films and it can be used for several crops in different climatic conditions with a key advantage that it doesn’t need to be removed at the end of the crop cycle. Due to its complete biodegradability, Mater-Bi mulch film can be ploughed into the soil at the end of the crop cycle where micro-organisms will transform it into carbon dioxide, water and biomass. “Mater-Bi provides several advantages: it helps prevent weed growth, increases the soil temperature, improves irrigation effects, maintains the humidity and at the end of the harvest it is ploughed under the soil and it disappears.” Explains Javier Molviedro of the Cooperativa Santiago Apóstol who has used Mater-Bi mulch film for the last 15-20 years. 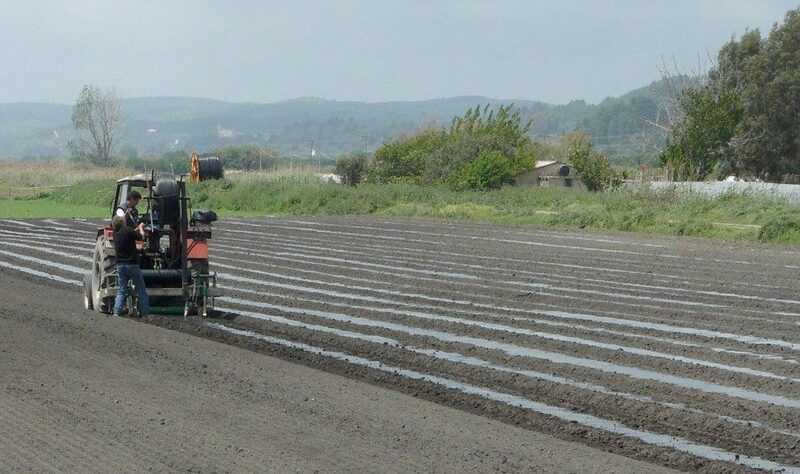 The field preparation to lay the biodegradable film is the same. “Soil is prepared, tilled and the film is laid the same as you would with polyethylene. The important thing is to work very well the soil” tells Vicenç Armengol of the farm Petit Plà. “Crop growth usually lasts around five months. The biodegradable film performs perfectly throughout the growing cycle. It’s incorporated together with the rest of the cultivation and normally it disappears in one winter” tells Manuel Valls of Cal Valls.